Rhinoclemmys pulcherrima is one of nine turtle species of the genus Rhinoclemmys. There are four recognized subspecies (R.p.manni pictured). The background colour of their skin is a dark olive green, but this is decorated with an arrangement of various red to pinkish-red lines and stripes. 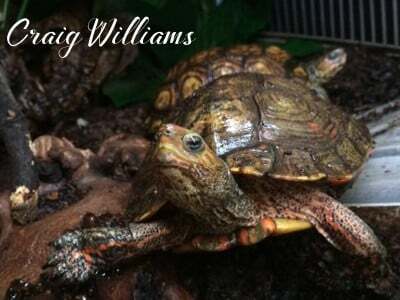 In both sexes, the brownish ground colour of the carapace is adorned with yellow and red concentric rings and black markings, giving a highly attractive overall appearance. Hatchlings are housed in small groups, in 1.2 x 0.3 x 0.45 meters (4 x 1 x 1.5 feet) vivs with cat litter trays as shallow pools. Adults are housed indoors in large vivariums of 1.8 x 0.6 x 0.6 meters (6 x 2 x 2 feet) but the bigger the better. Bio-active or planted vivariums greatly benefit this species, but take care not to use toxic plants or cacti and sharp grasses. Spider plants and bromeliads form the basis of our habitat décor, cheese plants also do well. As do Pothos vines, and pansies. Fights between both sexes are regular and can be vicious. Almost always in the freshly changed water, and sexually charged. At all other times these turtles live peacefully together. And when separated, may become distressed. I have observed long term partnering in my animals, with females guarded closely by males. Mating always takes place in water. Outdoor enclosures are not viable in the north of England where I live. But wherever possible, walls should be dug deep, and a lip placed around the top edge, as this species is an exceptional climber. With sun and shade provided, in the correct climate it is always preferential to house reptiles outside. A larger shallow pond should be provided outdoors too. Cover is essential. Leaf litter, wooden open fronted hides, plant pots provide cover-security. Mix of compost, coir, and orchid bark. Leaf litter over the top kept moist/damp is essential. as a part of daily routine is to dig down and bury themselves. Without the option to dig these turtles will fair badly. The substrate should not be allowed to become so dry it dusts up. Coir dust can be irritating to the eyes and respiratory systems. We use 5% UV t8, jungle dawn for plants, on a 10 hours on, 14 hours off timer. Additionally we use a ceramic heater as a heat source to create ambient temperature of 28 °C (83 °F) and a basking lamp capable of creating a hot spot of 32 °C (90 °F). Also in the large enclosures I have mats mounted along the walls at the hotter end just in case both elements fail. Adult Rhinoclemmys pulcherrima will need larger water areas, mine use under bed storage boxes with homemade ramps for access. The pool should only be a little deeper than the top of the shell at resting. If they flip over in the water and it’s deeper, they cannot right themselves and will drown. Females may also be drowned by overzealous males, in deeper water during copulation. Clean daily, or filter and every two days. This species only ever defecates/urinates in water, so cleanliness is essential! We use 56 litre under bed storage tubs, with 30 litres of water in them, ramped in/out. And small internal canister filters, purely to agitate and aerate the water between changes. Rhinoclemmys pulcherrima have a habit of leaving the pool and covering their bright carapace markings with soil, flicking it over their back with the front legs. Perfect for camouflage, bad for water filters! Expect them to do this the second the water is changed, making it instantly “dirty”. Many care articles for Rhinoclemmys pulcherrima cite that this species may become less aquatic with age, but in my experience it depends on the individual and a soak pool should always be available, especially if the correct humidity cannot be maintained. 95-99% is optimal, twice a day misting sessions will help to keep it close. The turtles genuinely enjoy the shower and will come out from hiding spots to bathe and search for earthworms after the “rain” instinctively. Young should be fed daily. Every two to three days for adults, with more frequent animal protein for growing individuals. Once weekly, feed should be dusted with a good quality reptile vitamin powder. Balanced diet of fruits, greens, and animal proteins, such as earthworms, mealworms, slugs and snails (from safe sources). If possible, a worm farm will provide you with the favorite food staple. It is possible to keep live worms in a well maintained, bio active vivarium. The turtles will actively hunt them down, quite quickly. Dandelions, romaine, Banana, Mango, Strawberries, Blueberries,Apple, Grass, and darker greens are all readily accepted. We don’t use any kind of pre packaged reptile food. Just good organic fruits and veg. Try not to. Hand feeding helps calm down nervous individuals. Like most reptiles, unnecessary handling is stressful, and they may urinate on or at you (they’re a surprisingly good shot), the claws are also quite sharp and will break delicate skin. 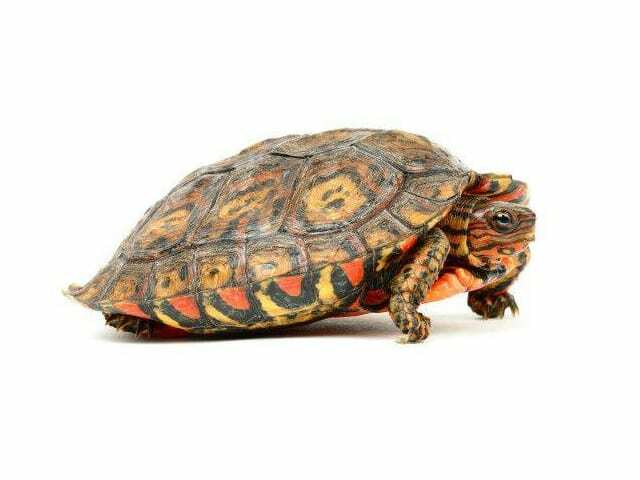 Like all turtles, Rhinoclemmys pulcherrima can and will bite if scared, and will draw blood. Spot clean, bio-active is good, substrate should be changed when necessary. Respiratory infection is often cited, when temperatures drop suddenly outside the natural ranges (20-30 °C (68-86 °F)), and may be fatal. Shell rot may occur if the substrate is too wet for long periods of time (stagnated) . wounds from fights are common around the neck and feet, these are not usually serious, and under good husbandry conditions need no attention unless obviously infected. Many specimens are missing the tip of the tail from these disputes. WC will be dehydrated and likely infested with parasites on arrival. Most individuals respond well to panacur. However we have had one fatality through allergy. This was a wild caught animal, in poor shape upon arrival. Parasites should not be a problem in captive bred specimens. If you have any worries, visit a competent reptile vet.